MANGUM—It’s a story of God working through a newspaper man to help revive a church. Casey Paxton has been the owner of the Mangum Star-News since 1999. Though he has lived elsewhere, he has a deep passion for his hometown and for the people of Mangum, including the members of Mangum, First. Paxton and members fellowship during the extended welcome time of Mangum, First’s worship service—a key change that Paxton said encouraged an attitude of loving others. His family were longtime members at Mangum, First, as his father led the music during worship services for 54 years. Paxton’s history with Mangum, First includes being involved with Mangum, Trinity, which started as Mangum, First’s mission church, and this is where, as a young man, Paxton made a profession of faith in Christ. Life continued for Paxton. He and his wife Karla married in 1971, lived in different places, but eventually came back to Mangum. Life also continued at Mangum, First, but the church went through a long, dry spell. Paxton was attending a different church, but his passion for Mangum, First remained strong. The next day, one of the deacons from Mangum, First came to Paxton’s office. “I saw a really broken man that day,” Paxton said. The deacon told Paxton, “Casey, we need help. Would you please come help us?” Paxton preached that Sunday on God telling Joshua it was his time to lead the people of Israel. Eventually, Paxton became Mangum, First’s interim pastor. He admitted he never served previously as a pastor of any church. Most of his leadership experiences has been as a youth or music minister. To put into perspective where Mangum, First was before Paxton became the church’s interim pastor, attendance dropped to averaging 35-40 people on Sundays. 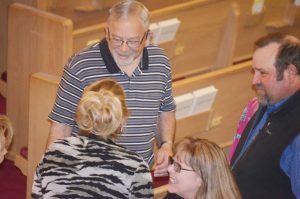 Steve Martin, a deacon at Mangum, First, said he thought the church would have to close its doors because bills could not be paid. People kept coming, and the church kept changing positively. Paxton said members were coming to him and asking how to reach more people. He would tell them to talk to people about where they were going to church. An avid OU fan, Casey Paxton agreed to preach in an OSU jersey if 100 people attended a worship service at Mangum, First. To encourage the church body, Paxton gave them a challenge. 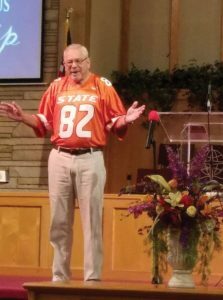 As an avid fan of the University of Oklahoma, he agreed that if 100 people would attend a Sunday morning service, the next Sunday he would preach wearing an Oklahoma State University football jersey. It happened one August Sunday. Mangum, First had 100 people attend, and Paxton made good on his promise, sporting a bright orange OSU jersey the following Sunday. God continued to bless Mangum, First. Since Sept. 1, 2017, 35 new members joined the church. Also, Paxton said, a number of people who left have returned to Mangum, First. “God has done a work,” Paxton said. “God is the God of second chances. He really changed my heart, and you can see the change in the people. On Aug. 13, 2017, Mangum, First voted unanimously for Paxton to be its full-time pastor, and the church continues to see great things happening. Paxton is insistent the blessings that Mangum, First has experienced are not about him but totally about what God has done. In a time when “fake news” is raging, this newspaper man is sharing the Truth. View more articles by Chris Doyle.